Richard's first carpentry class with their families. I have never really felt at home in this country. is a land of indigenous families who are poor. living amongst them, as well. " RICHARD FLAMER, 61, lives in Chiapas, Mexico. He has been there full time since 2001, six months a year prior to that for six years. He is married to Araceli Benitez Moya, A Zapotec woman from Oaxaca. The two of them run a Catholic Worker farm, which offers hospitality and housing to those in need, chiefly migrants on the road from Central America. You are now up here in the states. Where exactly are you, what are you up to? How long will you be here? And then you will go back to Chiapas? Do you view that as your home now? Or, do you feel you are back home, now, up here? I am currently in Champaign, IL. staying at the local Catholic Worker while working in construction in rebuilding a small house for a local family. That is, I am working for money to get enough to build a house for my wife and I on the farm site. Each year I come back to the U.S. to raise funds, do talks, do a little construction, whatever it takes to continue our life in Chiapas. I do not feel at home in the U.S., and, I find that the more time I spend in Chiapas the more I realize I have never really felt at home in this country. 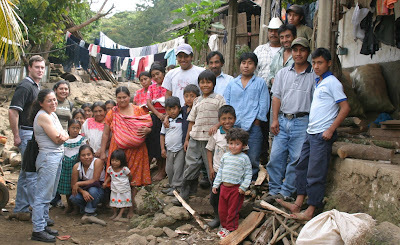 Mexico, especially in the Southern portion, is a land of indigenous families who are poor. I feel so much more at home surrounded by the poor, living amongst them, as well. NAD: Where did you grow up? You were in Vietnam. What year. Where. Were you in combat? Did you see all the bad things we picture? How did you end up there? Vietnam was the best of times and the worst of times (thank you Charles Dickens.) It was a fundamental time for me to be in the war. My work was largely in Military Intelligence so I ended up being out of combat most of the time but responsible for locating targets for the B-52 bombers. For a short period I was on the ground working with a Marine unit in surveying target damage, etc. NAD: When you came back, can we assume you were depressed, PTSD? What did you go through, and what pulled you out? You were involved in some civil disobedience. You have done some on-purpose jail time and some no-so on purpose — right? I have done some short stints in jail for Civil Disobedience. My time when I came back was awful but I was fortunate in finding a route for my intellect at a good College (Goddard College in Plainfield, Vermont) and a way at a healing. When you woke up this morning, what did you feel you had to get done before supper time? I don't know that I have a single passion anymore. My whole life seems to be a life of passion. I try to approach everything with the same hope and fervor. I find that I have the same questions as I had when I was a youth but the importance of the answers has waned. These days I take great joy in almost everything around me. As for getting things done — I don't much worry about that stuff. As Dorothy Day once offered us: "God doesn't ask us to be effective, only faithful." when I was a youth but the importance of the answers has waned. NAD: How do you see the USA now, from your front-porch perch way down south? There are many things to talk about in your life, that is why there is a movie in the works, but could you just briefly mention your days down there as a photographer. You really have been sort of a good works wanderer. It must have been fun, in a way. I don't know that my life has been as a good works wanderer. I think what I started was a kind of atonement. That is, I searched for a way of atonement and ended up having a life that helps in serving others. One sort of forgets about all your travails and finds solace in the faith of those around you. As a photo-journalist I was always trying to take pictures which would somehow contribute to a peaceful life — I ended up taking photos of the people that I learned to love. It is an enormous joy, this life. I have the best life in the world. NAD: Tell about the movie being planned about your life. On the website for that project there are quotes from Dorothy Day. Do you feel pretty strongly about the Catholic Worker, the poor, the service philosophy? I feel strongly about Dorothy Day, the Catholic Worker, etc. but I am unhappy about the idea that the film will be about me. The truth is, the measure of our lives is in love; how well we can be disciples. It's not about me, it's the work.